A Caesar salad is a classic of the kitchen and makes its appearance in many guises. From side dish through to a full-blown entrée, this salad is sure to delight. In this recipe it pairs well with grilled chicken and is further transformed by tucking the salad into a wrap, adding to its immense versatility. The wraps make a super light lunch or addition to a lunch box. Cut into smaller pieces, you can even serve them on your party buffet at special occasions. Even though these wraps are super quick to whip up from scratch, we understand that everyone has those moments when they are super busy. That's why we've provided an even faster alternative with store-bough Caesar dressing. We won't tell anyone, promise. Lightly flatten the chicken breasts, one at a time, with a meat mallet of the back of a meat cleaver, taking care not to rip the meat to make it an even thickness. Season the olive oil with a pinch of salt and pepper then brush over each flattened breast. Heat a griddle pan to hot, but not smoking, and cook the chicken for 6 minutes on each side pressing slightly with the back of a spatula to creating charred grill lines on the meat. Once cooked, take from the pan and place on a plate, cover with a tea cloth and leave the meat to rest. Unless using store-bought dressing, make the dressing by blending the garlic and anchovies using a hand blender, or food processor, until combined. Tip the mixture into a small bowl, add the egg yolk, Dijon mustard, and lemon juice and using a hand whisk add a few drops of olive oil and whisk until combined. Continue this way, adding a few drops and whisking, until all the oil is used up and the dressing is thick and creamy. Taste and add seasoning. Rip the chicken into shreds and add the shredded Romaine and Parmesan and enough sauce to combine. Mix lightly, but be gentle here as you do not want to make the salad mushy. Divide into eight portions. Place a pile of chicken salad in the middle of a wrap. Fold over the bottom and roll up tightly. Continue with the remaining wraps and serve immediately. 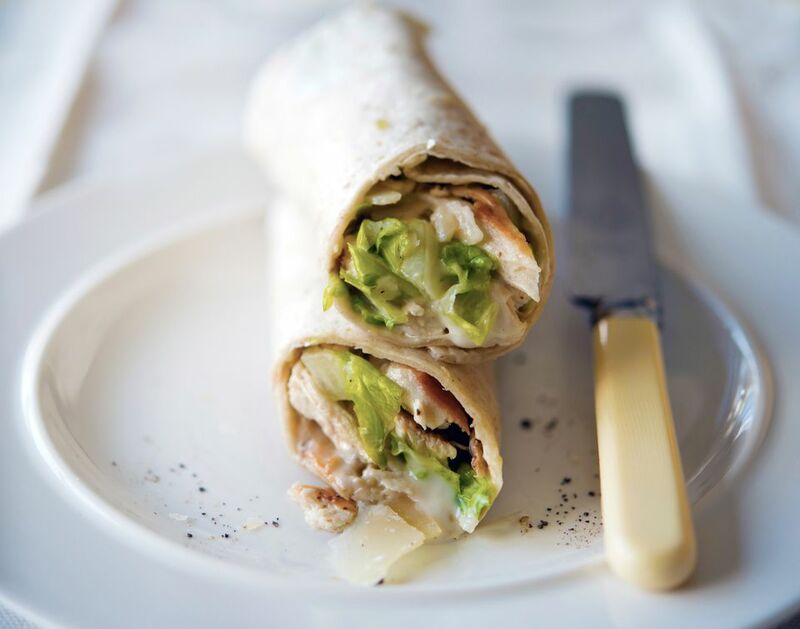 The wraps can be served either warm or cold, which makes them super for a lunch box or as part of a party buffet. Any leftover salad can be served on the side. In a hurry? Swap out the Caesar dressing ingredients for 4 tablespoons of your favorite store-bought Caesar dressing and follow the remainder of the instructions!